The hawk sees the mountains and the mouse at once with unnerving vision and a singular clarity. This predator medicine teaches how to clear away all distractions and hone in on the root of a matter. It is a lesson in the exquisite tension of conflict which teaches how to engage a challenge without causing reckless harm. Hawk medicine brings messages of the highest certainty regardless of political agendas. She knows that confusion is a temporary illusion and she teaches that clarity is attainable only if we accept that it is not stationary. Truth and clarity must be tracked with a hunters vigilance to the ever-shifting circumstances around us. How can we know what is true and right in a world of infinite situations? How do we speak that truth against a tide of objections? All bird medicine is an adventure in detachment. To speak the truth we must separate ourselves from what we want that truth to be, and allow it to speak through us. 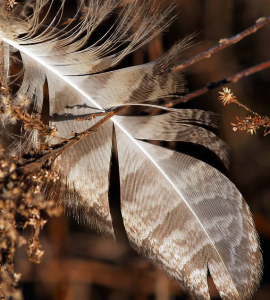 A feather is not just a symbol of flight and departure, it is the exact physical instrument used for reaching higher ground. The human mind is also an instrument of flight which is currently learning how to leave it’s ‘logical nest’ and experience life without the gravity of excessive analysis. The cry of hawk medicine soars through the tangle of mental debate to a cliff of knowing that is irrefutably true and as delicate as feathers. Hawks build their homes high in trees and rocky cliffs. 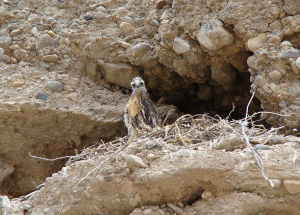 They mate for life and both parents raise the clutch of 1 to 3 Eyas (baby hawks) with the mother nesting and the father bringing the family food. The hawk is a raptor bird who takes by force. They hunt snakes, small mammals, and other birds. Their hunting tactics involve perching, waiting, and swooping down when motion is detected. They will also track an animal low to the ground in flight to seize with razor claws and beak. Unlike migratory birds, the hawk flaps her wings very rarely, conserving energy and using a gliding technique with wind currents. Hawks vision is simultaneously peripheral and precise taking in tiny details as well as the larger sprawl of the land. 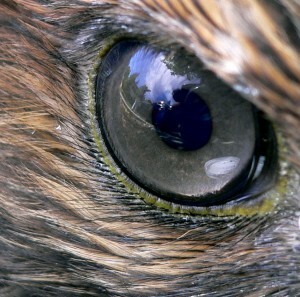 The eye of the hawk contains 1,000,000 photoreceptors per square millimeter in the retina which gives them an exceptional number of nerve connections to the brain. (The human eye has 200,000 photoreceptors). 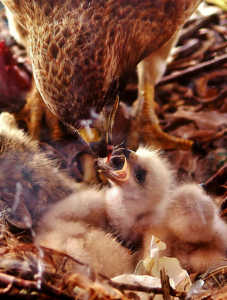 Hawk medicine sees all things large and small with the utmost clarity. This medicine teaches how to convey information without altering or editing the content to suit personal agendas. It is not possible to avoid politics in the Age of People. Even the smallest of endeavors among willing friends require us to navigate the distances between our individual perspectives. Remaining impartial, if only for a moment, helps us to hunt down and observe hidden misguided psychology, allowing more information to reach us. Learning how to put aside personal history develops a neutral space where truth can enter the given circumstances. But how do you learn to put aside personal history? It sounds like quaint theoretical advice, but how do we do it? How does a bird lift off the ground and fly? He just does. He doesn’t think about it. He does it. We can break down the scientific aerodynamics of flight, but the answers to these questions will not bring us closer to the dynamic skill of flying. In this same way, thinking about how to stop thinking will only generate more thought. To move out of a tangle of thoughts, hawk suggests we put more attention on our sense of vision and observe the physical facts in front of us without question. Taking life at face value helps to reduce unnecessary confusion. Confusion drains energy and weakens our ability to defend our personal space. Hawk medicine asks that you become intolerant of confusion and take immediate action to clarify a situation. Observe your surroundings with unrelenting honesty. This action is akin to lifting off into flight and requires no mental analysis. Observation is not a physical action filled with exertion. It is the action of being. Look with hawk’s vision at the colors and textures around you. Bring all your attention into the physical environment. Practice seeing all objects (including people) as purely visual information with no deeper meaning other than their contour lines and colors. Hawk medicine knows that life is hard and it hurts. Road-weary travelers often seek permanent answers that will relieve them of the pain of life. We often wish to arrive at certainty so that we can put down the struggle and relax into righteous confidence. Hawk medicine warns that certainty does not occur in the wild for very long. Truth, like light, has a duel nature which is impossible to know indefinitely. Where light is both a particle and a wave, truth is at once situational and absolute. What is true for you is not necessarily true for others in a given situation. What was true yesterday may shift tomorrow. How can we tell our loved ones we disagree in a way that doesn’t lead to debilitating conflict? Hawk says- conserve energy and avoid conflict until you are certain of your skills of communication. Take time to clarify what is true for you personally. It is not necessary that you immediately proclaim it to the world. The quiet event of your inner learning process has a deeper and longer lasting effect than any efforts you might make to explain what you know to others. Not needing to be immediately understood will arm you with an objective detachment enabling all parties to find the truth of a situation. In fact, if you have indeed locate a personal truth you do not need to spend energy convincing others of it. It will effortlessly speak for itself when the time is right. Learning how to endure the frustration of being misunderstood avoids causing unnecessary conflict, and expands the sky space available for everyone. The messenger does not have to defend or justify the messages they bear. They only need to protect the integrity of the content from distortions and be open to teachings that continue to further clarify that message. 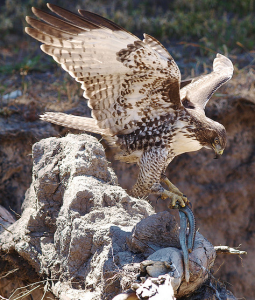 Hawk is a hunter. She kills to live. Her medicine may be confounding in its violence, but it is in harmony with the highest of all cosmic mysteries. Where she may teach patience and tolerance, she is also asking that you aggress upon finding your own voice. Every living being on Earth is a teacher and a leader of some truth about life that only they’ve experienced. Learning how to sort through the confusion of your journey and share your lessons with others is of the utmost importance, and is directly related to our survival as a species. Personal self-empowerment is the most essential and most effective first step in any effort to counter large scale global imbalance. Hawk urges you to find your voice and start using it. There may be conflict in doing this, but we can not refine if we do not begin. Stifling your inner knowing for fear of being wrong or being attacked does not allow you to hone your skills as a seeker of high quality experiences. The ultimate endeavor Hawk medicine teaches is to learn how to conduct ourselves in conflict with responsible high-quality integrity that does not result in the degradation of one party or the other. Defeat, as Hawk knows, is not degradation. It is simply one outcome of two forces in conflict. Under all the emotional and psychological tectonics of the human experience there are Truths we hold in silent knowing to be self evident across all situations. These truths are metaphysical absolutes which travel through all mediums of form and speak to us of the nature of power, grace, and ethics. These truths are knowable, not through the logic of the mind, but through the silence of the witness within.